Torq Transloading Inc. recognizes that safety is paramount on railway sites and that railway transloading operations requires that safety issues be given the maximum priority. All employees and contractors associated with this type of work are fully aware of this requirement. Torq and its team have the highest commitment to Safety and Environment; above all it is our number one priority. We have a comprehensive safety program that ensures a safe work environment for our employees. Our employees take ownership of our safety program and work together to abide by all company and customer safety policies and procedures. In addition, Torq works with all governing agencies to keep current and in compliance with all legislations, regulations, standards and rules. 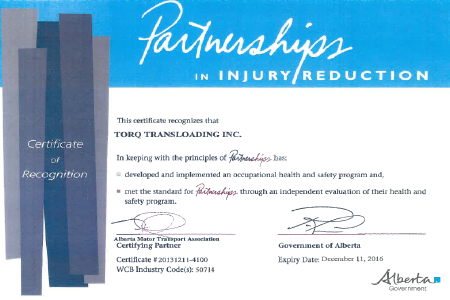 Torq's safety objective is to create an injury and incident free workplace that protects the staff, customers, the general public and all company assets along with becoming the safest industrial railway transloading operation in the industry. 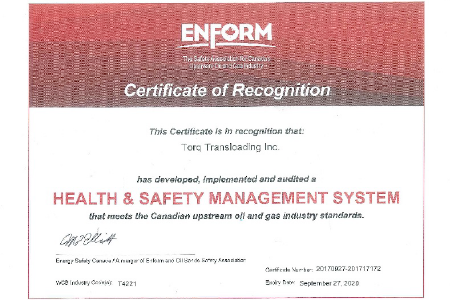 We are fully COR certified in Alberta and Saskatchewan with our certifying partner being Energy Safety Canada (Formerly ENFORM). Torq is also a registered member of AVETTA, ISNetworld and ComplyWorks where we take pride in maintaining high ratings. Here at Torq we only supply our employees with the most up-to-date, state of the art equipment, allowing them to do their work safely and efficiently. One example is the Sky Eye meters we use to measure transloading of commodities such as crude oil. Sky Eye meters are manufactured in Alberta, Canada, and are built with the latest technologies to ensure accurate readings for volume measurements. We aslo conduct flash point testing for all our sites to ensure all equipment continues to operate efficiently. Torq has a comprehensive code of business conduct. All employees at Torq Transloading are prepared everyday to perform their jobs ethically and to the best of their abilities. Torq Transloading and its employees operate in a way that serves our customers, adds value to our owners, and preserves our reputation for trust. This code of business conduct covers, in general terms, some of the various situations that employees may encounter. While it is not possible to cover every situation that employees may face, there are certain basic principles to which every employee adheres to.